Flapjacks are a great standby for the dairy/egg/nut allergic household. When other people can produce some shop bought cereal bar for their kids, I was always lacking in options. There came a time when yet another biscuit, fruit bar or rice cake just didn’t hit the spot. So for a couple of years I made a passable flapjack recipe found in a GoodFood magazine thinking that was as good as they could get without all the butter. Then last summer we visited Avebury and stopped by Stones, the only vegetarian National Trust cafe and bought a simply yummy vegan coconut flapjack that my daughters could safely eat. (Oh the joy of being able to buy a food item in a cafe!) So, my mission to find an awesome vegan flapjack recipe began. I can tell you, there are A LOT of dreadful flapjack recipes out there, reminiscent of chewing on a mouthful of sawdust! But, in my opinion this recipe cannot be beaten. 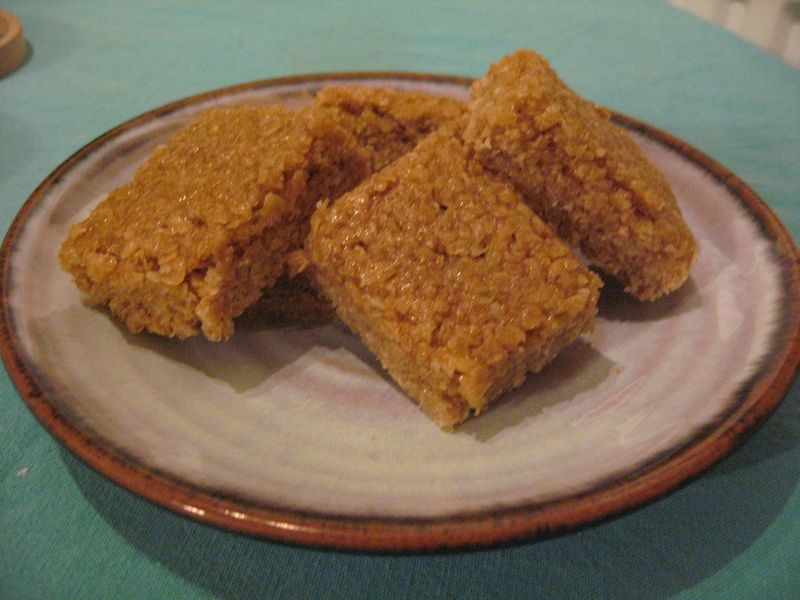 It is from Celia Brooks Brown (one of my real vegetarian cooking heroes) and the only alterations I have made is to use golden syrup rather than honey, which makes it vegan but also avoids the very strong taste you can get from honey, and added half a teaspoon of salt to enhance the flavour. These freeze brilliantly and are always a hit! – Cool well before cutting into bars/squares. Or freeze whole and cut when defrosted. – Try not to eat too many! !